Today I am drunk from travel; jet lagged with brain fogginess. My appetite yells HUNGRY at all the wrong times and I am tired when I need to be awake. It required an entire 24 hours of travel to return home to the USA from time spent in Singapore and Siem Reap, Cambodia. I will be like this for a couple days. 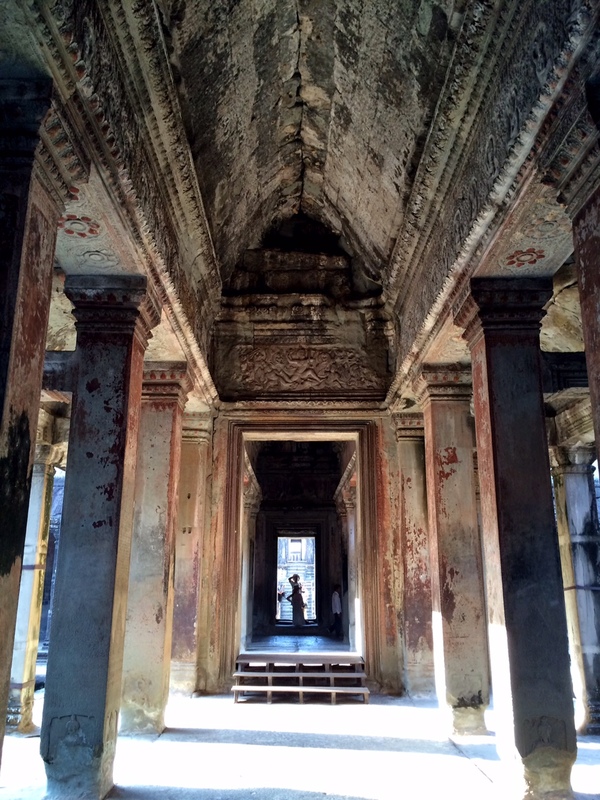 My photos prove Angkor Wat was not a dream. I was indeed there, glistening with sweat from the unwavering heat, walking the powdery red dirt path up to the bridge that crosses the ancient moat surrounding Angkor Wat. Then, for several days, experiencing a silent other-worldly shadow of a former civilization; a place where people lived and loved and laughed; a place where 40,000 elephants walked the same stone paths I walk as they built the city; a place crumbling from the insistent destruction of time and massive trees roots that meander along moving gargantuan blocks of stone as if they were legos. These were a people who appreciated the beauty of intricately carved stone – story-telling daily life in sculpture of meticulous detail – revealing subtle expressions on faces and costumes of fabric, folded and wrapped on dancing women, working elephants and animals, flowers, and gods and goddesses both evil and benevolent of spirit. 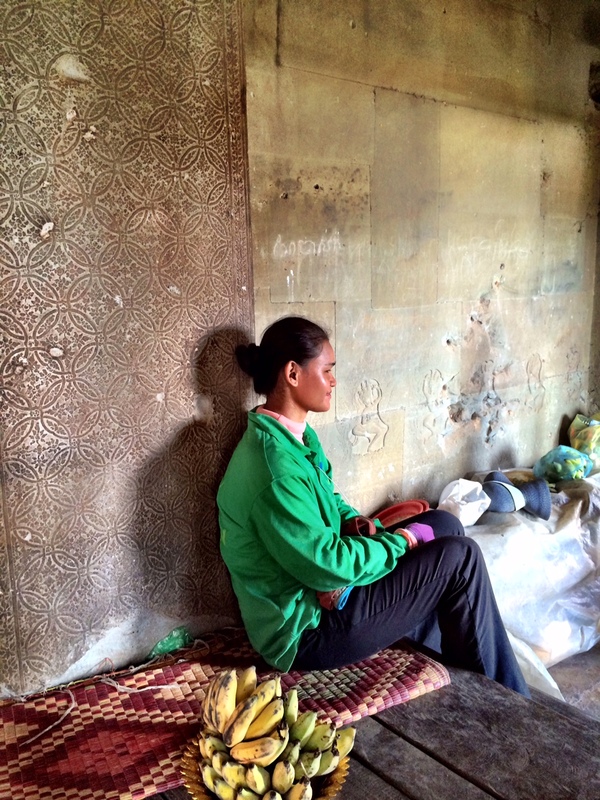 Constant renovation is a given – it goes on and on through the donations of other countries who care – as walls continue to collapse and the monsoons roar in hell bent on destruction. One favorite of mine was a deep, dark stone room whose interior walls are covered in precisely spaced Ping-Pong ball sized holes; hinting that its walls were once embedded with giant gemstones so as to catch the sun’s rays from a tiny slice in the stone and light the darkness with multi-colored reflections. Then another smaller stone room where we are told by our extraordinary guide, An Rachna of Cambodian Trails, that in spite of what might seem perfect conditions for acoustics, no human voice or music will echo there – but if you thump your chest over your heart seven times the deep heart-sound will indeed “echo” when you stop, seven times, reverberating in various intensities according to the stress level of your soul. And it worked. 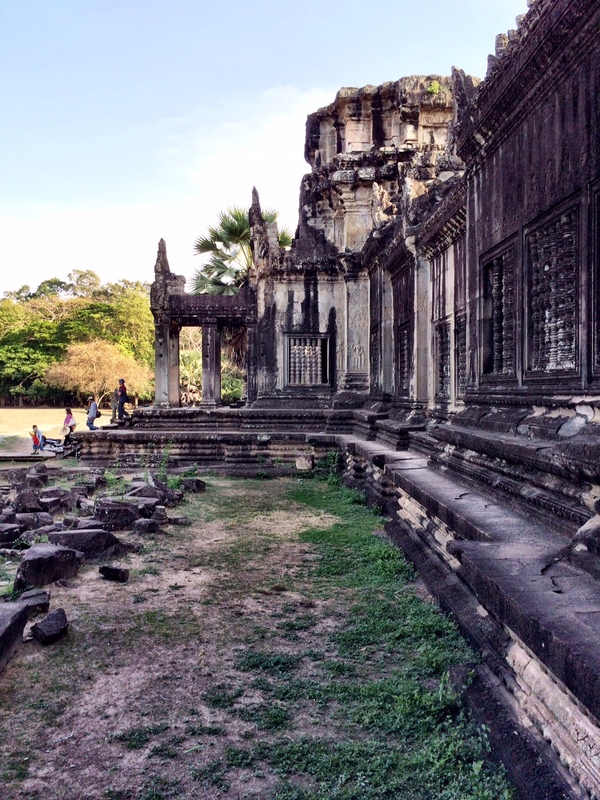 Angkor Wat is one discovery after another, each raising another group of questions in your mind – what happened here? Why did these intelligent people die? How could the site possibly have gone undiscovered for so long? It is an enigma wrapped in mystery…you almost feel that you know the people after two or three solid days of tracking their lives. 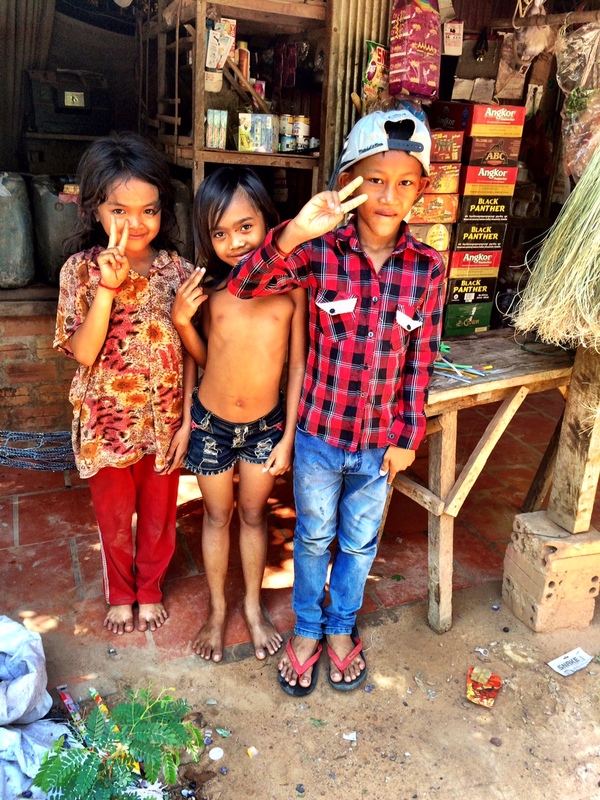 The contemporary people of Siem Reap will welcome you. They have melancholy eyes and joyful smiles. They are kind, helpful and eager to please. They spend time with you in conversations that go deeper than trivial inquiries about how you are today and where you are from – they hang onto your every word with a genuine curiosity about where exactly you are from in the USA and what it looks like there – how do you manage to get all the way up to your mountain home in the Colorado Rockies? What is snow like? They do not want you to leave without keeping the door open for your return. Cambodia is still, quite literally, maimed, mangled and war-torn from the days of the Khymer Rouge; land mines are a large concern, and the unspeakable atrocities toward the Cambodian people are evident everywhere you go. In rural communities fresh well water is becoming less rare thanks to donations from private individuals and countries, but still in short supply. A water well can be purchased for just about $100 and there are many organizations worldwide who will handle a donation for you – one well can supple several families who live near each other. The children are tiny, also in great need of better nutrition, and milk for babies and toddlers is scarce. We were able to spend hours of time driving the countryside, visiting and smiling with families and children, watching them cook lunch for the family along the winding dirt roadside. 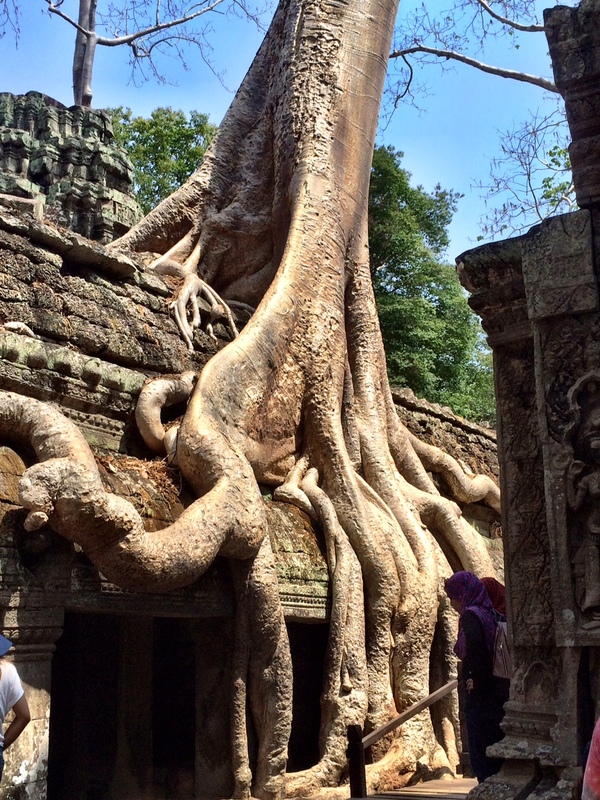 This series about our trip to Cambodia in 2015 will continue…..probably for the remainder of my life. I would love to take you along. 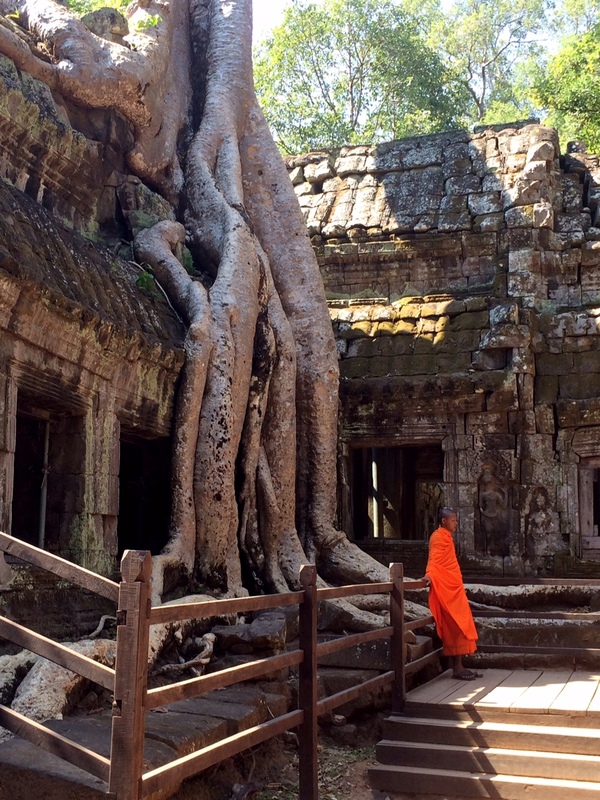 Please visit http://www.cambodiantrails.com to learn about guides in Siem Reap.